Polydex piping systems can be used for distribution systems in housing, administration and community buildings as well as for industrial installations. Polydex is designed for transport of cold and hot water. It is also used for the distribution of compressed air. Polydex is the first complete PPR piping system in Pakistan that conforms to international quality and safety standards. In order to take advantage of its chemical resistance and other system properties and use of system for transport of other liquids, gaseous or solid media - an individual assessment of any such case would be needed. Potable water pipe networks for cold and warm water installations i.e. in residential buildings, hospitals, hotels, office and school buildings, ships, etc. Pipes & fittings in 20mm, 25mm, 32mm, 40mm, 50mm, 63mm, 75mm, 90mm & 110mm in length of 4 meters. Polydex fittings carry a mark 'Ekoplastik' (EK on fittings). 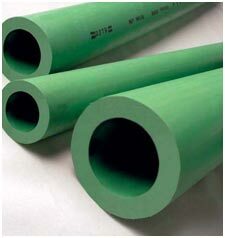 Note: PN 10 pipes can also be supplied against specific requirements.